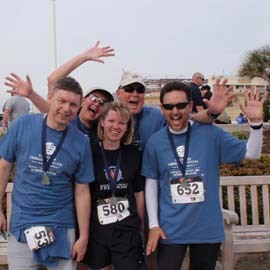 Honoring the sacrifice made by military men and women across the United States, TCC students and staffers from the Center for Military and Veterans Educations laced up their running shoes for a 5K event held at the Virginia Beach Oceanfront on March 24. The 4th annual Spartyka Wounded Warrior 5K run/walk attracted hundreds of participants and raised needed funds for the Wounded Warrior Project. TCC’s 30-member team was led by Barbara Brunson, team captain. Additional Spartyka Wounded Warrior 5K events were held in cities across the nation and around the world.